Spirit Dog is essentially spiritual in nature, addressing the love that lives on after death. Created simultaneously with Coming Home, it was filmed in HD on a beautiful mountaintop bald in the Blue Ridge Mountains, June 2008. 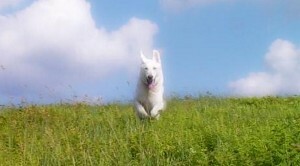 The original planned Dog Pearl became two Pearls after Tucker, our beautiful white shepherd Dog Star, broke our hearts in November 2008 when he died at age 9. He was a great dog, much loved. Because Tucker engaged so well with the camera that day on the mountain, we were able to create his own Pearl. His younger sister Lucy, a perky Boxer mix, is also part of this Pearl, with the two dogs romping together at the beginning. Tucker represents all beloved animals who have gone to Spirit, comforting the ones they have left behind. Like the Coming Home Pearl, Spirit Dog is a beautifully moving minute of dreamy slow motion. 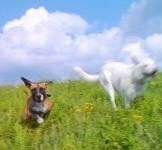 Spirit Dog from Little Pearls on Vimeo.Please play in HD if you can. Dog Pearls are meant to encourage adoptions; a closer bond between humans and animals; and a sense of what we have in common with companion animals in so many life experiences. They are about what dogs teach us, in terms of being human, as much as they are about dogs themselves.